hey do yall make these 34 expresses with inboards? Because if yall did i would order one as soon as possible. Good afternoon Justin and thank you for your inquiry. 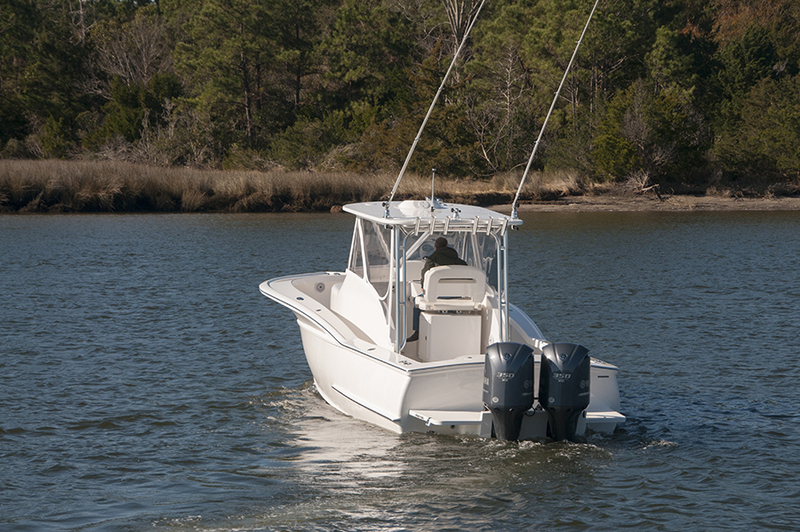 We offer a model with an Inboard Diesel that hooks up to a Jack Shaft and an Outdrive. I will have one of our staff members from the sales department get in touch with you directly. could yall possibly post some pictures on the website of the one with the inboard? We’ve posted 6 photos at the end of this gallery for you. They are of a single engine jackshaft installation on a *32* we built a couple years go. 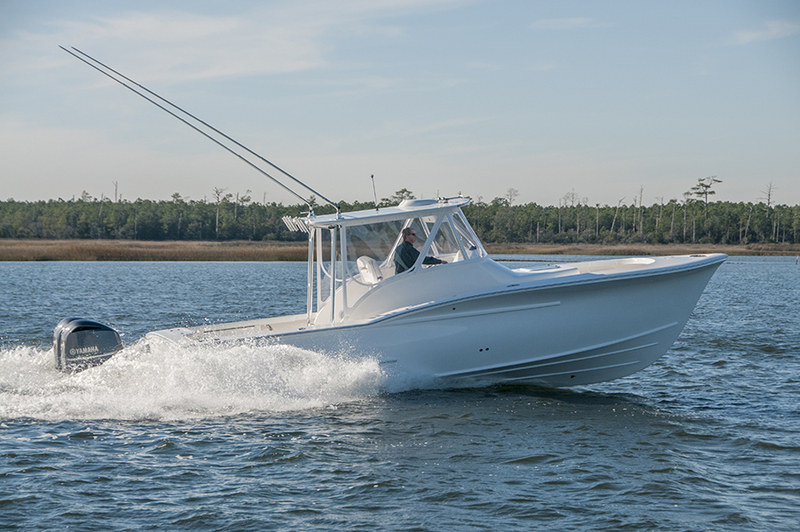 We have not actually built an inboard version of the new *34* semi-production yet – but will certainly do so for anyone who is interested in that option! We have not built an actual inboard version of the semi-production 34 yet, but obviously have done so in custom hulls of this size. We’ll get back to you shortly once we get the specifics nailed down on some inboard models & numbers we can confidently stand behind. Thanks for your continued interest! 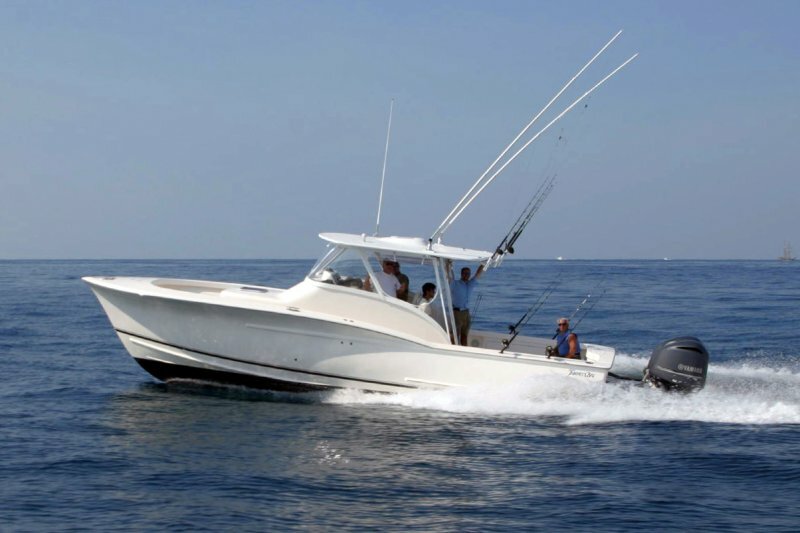 what do offer in full grown 35 express with a tower; with twin 440 yanmar 0r 450 cat diesel engines? No walk around. 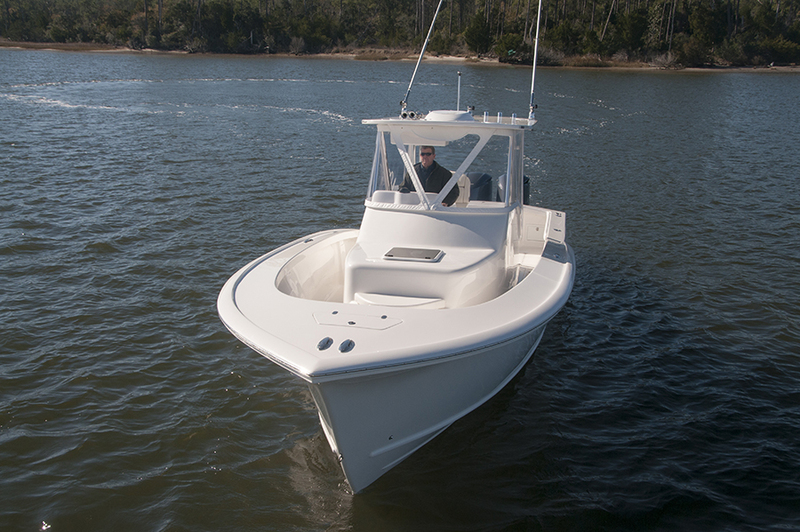 Hi Chauncey, we build a fiberglass 34’ center console walk around vessel, but most of these have been built with outboards. 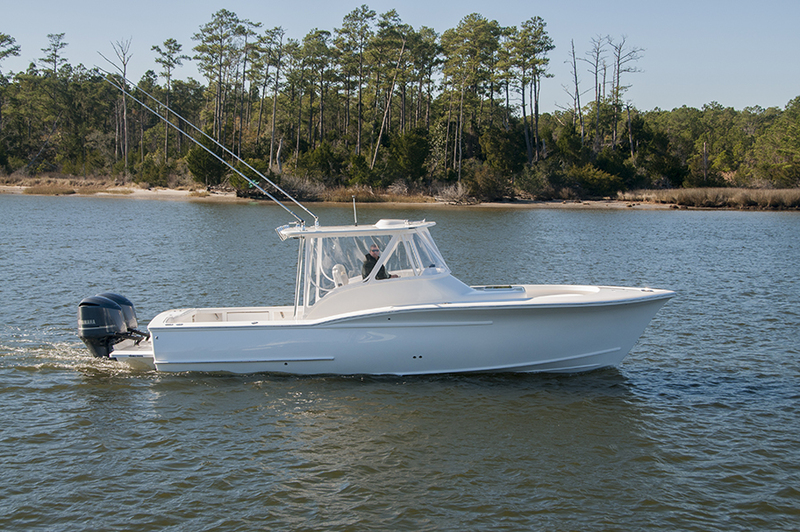 Jarrett Bay Boatworks has the ability to custom build any boat and/or model that suits your needs, a salesperson will be in contact with you shortly. Thank you for your interest. 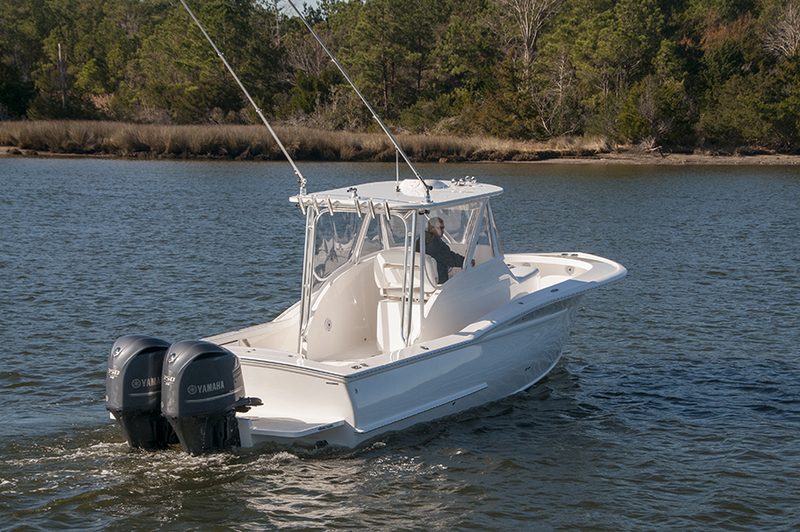 What is the fuel efficiency with the outboards? Hello, I would like to find out a base price for a 34 with twin yamaha 350’s. Thanks! Thank you for you interest Chad, a sales rep should be in touch with you shortly! I noticed the 34 Semi Custom: set up with 3 outbords ball park, with tower etc etc price range ???? Rumor has it the 34 semi production is really a 32? Is the 34 semi production truly a 37? Re: 32 w/ diesel IO… What was the power installed and what was the speed and fuel economy. I imagine it was quite good. Looks like Konrad twin-prop drive? I like that arrangement as it allows for a deeper cockpit. Hi Jim, a representative will be in touch with you directly, but yes the 32 I/O was a Konrad drive with a 425hp Cummins QSB 5.9L. 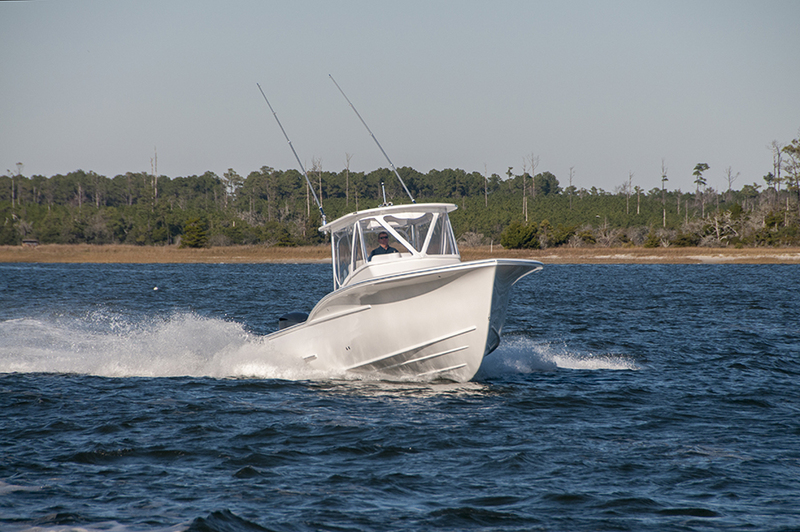 You can learn more about it in these articles from the period by Marlin and Southern Boating. Thanks for your inquiry and please let us know if you have any further questions. Sure looks like a Buddy Davis or Hines Farley Haul…? Will twin diesels fit on that beauty? Can you send me a full spec sheet by chance and different performance numbers on different engines you have? Will do Lincoln – you should have received an email from a sales rep.
Could you send me some information on the 34 with the jack shaft diesel configuration. What engine, hp, performance numbers, base price, etc? 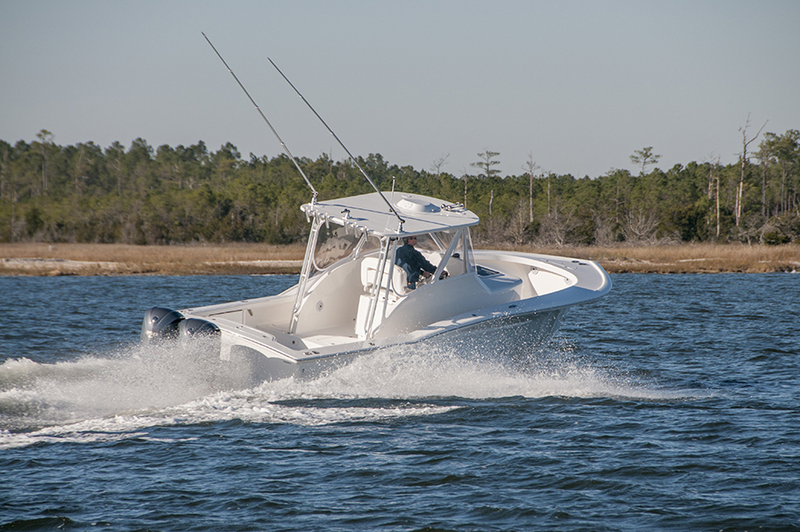 Could I also get the info on the twin yamaha 350 outboard configuration (base price and performance numbers). Thanks for your interest Dan, we’ll be sending you some info directly very shortly! Thanks for your interest Trey, a sales representative will be in touch directly via email. I am interested in purchasing a boat to tow behind my expedition yacht. I need something set up for fishing and diving. 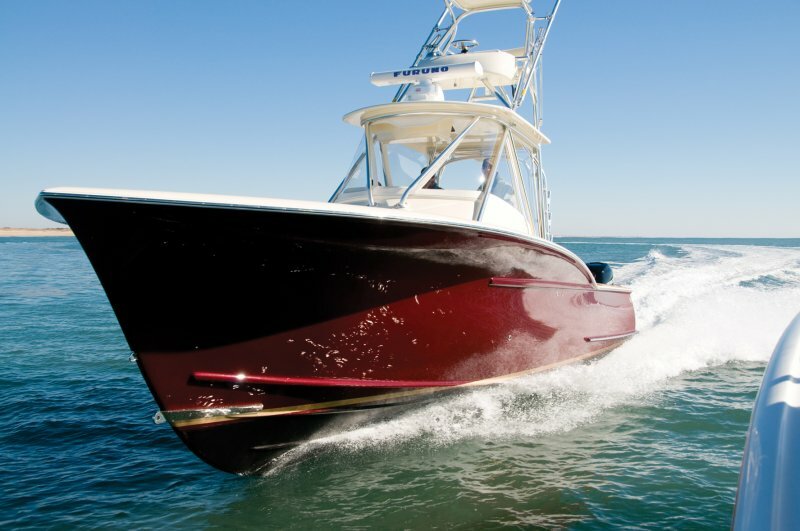 I currently have a 42 Hydra-sport center console but it weighs 26,000 pounds and is heavy to tow. I am looking for something in the 37-42 foot range, walk around preferable with inboard diesels. Do you have something that will fit my needs that weighs around 16,000 pounds? If so please send me the specs, approximate price, etc. The 34 is beautiful, absolutely stunning. Can you pls send performance data with 3x 300 hp outposts pls? 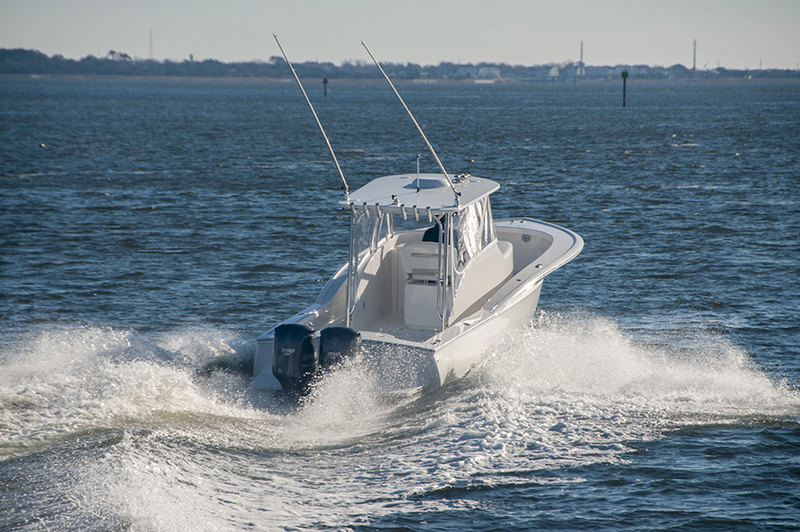 Also can she handle 3x 350 Yamaha outboards? Thank you for your interest Christopher, a sales representative will be in touch with you directly via email. Great lines to that boat. Three questions. Can you get this as a true express, not a walk around? Can you do one with triple Yamaha 350’s and the Helm Master? What is the build time for this model? Hi Stephen, a representative should have responded to your questions directly via email, but let us know if you have any further questions. 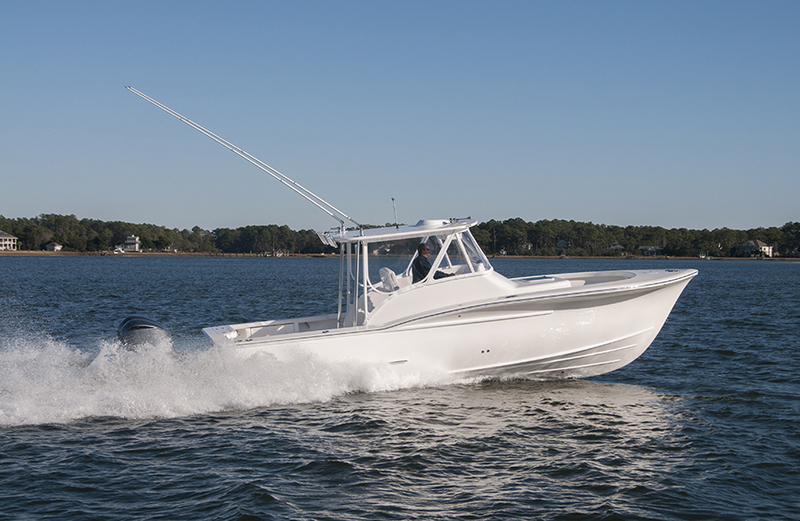 In short, yes, those things are all possible, though more than likely as a cold-molded custom boat as opposed to altering a hull/liner from our 34 semi-production line. 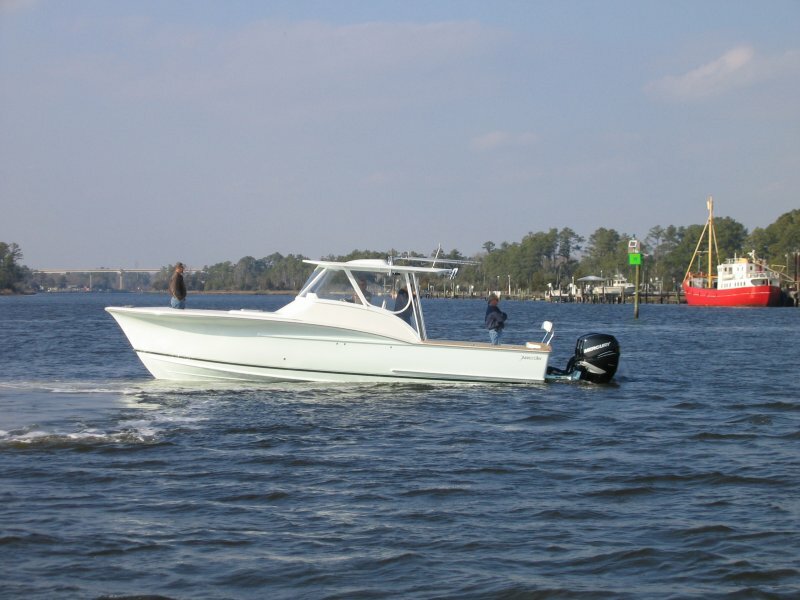 Thank you for your inquiry, our exclusive dealer Bluewater Yacht Sales currently has two such boats new and in stock. A representative from their team will be in touch with you directly via email. 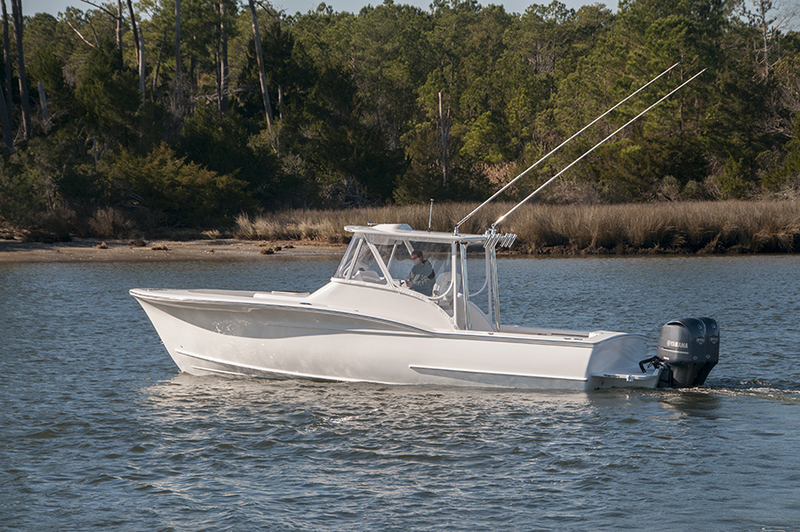 Thanks again for your interest in the Jarrett Bay 34! I am beginning my investigation to purchase a sport fisher in the 32-38 foot range. 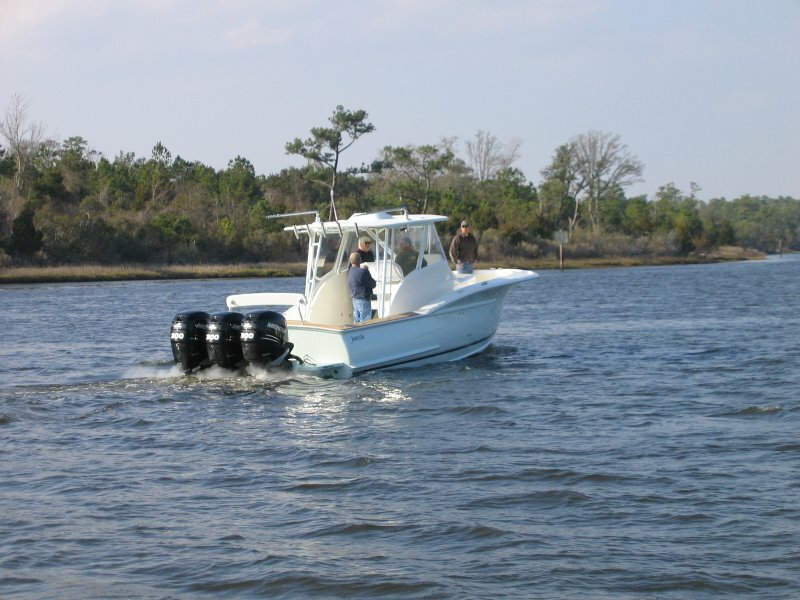 I favor outboards for ease of use etc. I would need helm master or equivalent on the boat. Your 34 looks beautiful and is of interest. 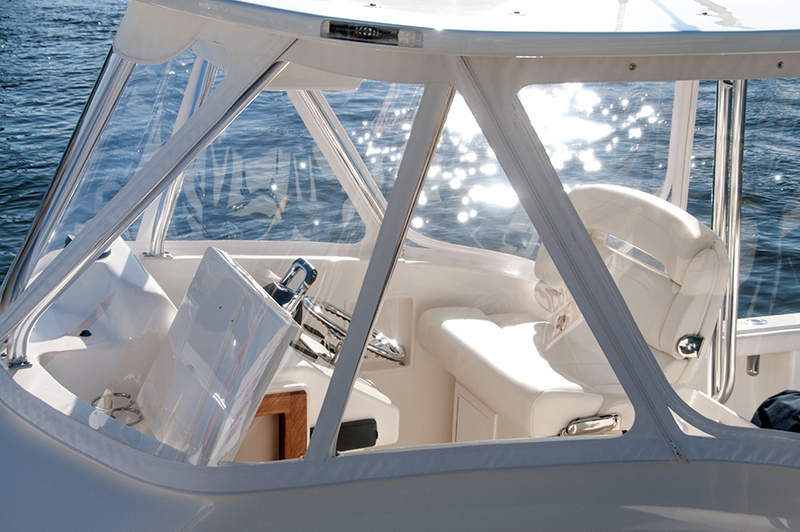 I fish the NE canyons and need a boat that can get me home safe. 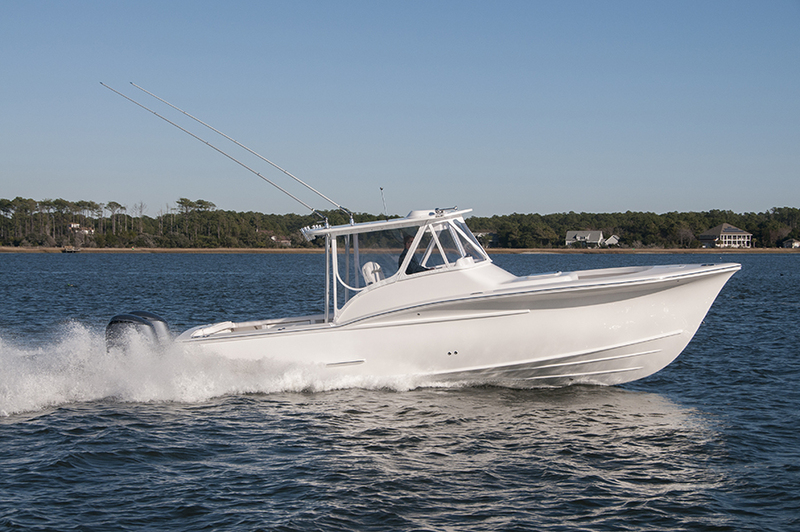 Was thinking about a regulator 34 prior to seeing the Jarret Bay 34. Please have someone contact me so I can get more information. Thank you. Thank you for your inquiry and interest Bob, a sales rep will be in touch with you with more information via email. Thanks again! Is the 34 express trailer able without tuna tower ? 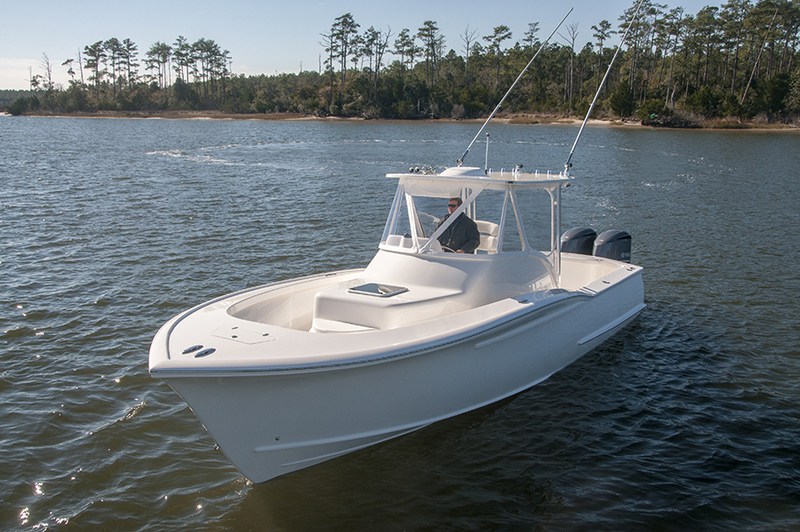 So I’m just curious, what would the price tag be specifically the one with the red hull and marlin tower? Also not that this matters but could you add on a live well and possibly change up the helm and galley layout to other customer standards? Please let us know if you have any further questions, and thank you for your interest!